FAOSTAT provides time-series and cross sectional international data from the Food and Agriculture Organization (FAO) of the United Nations relating to food and agriculture for some 200 countries. It will soon support a national version, CountrySTAT,for a number of target countries, primarily in sub-saharan Africa. Major contents include: commodities by country, coutries by commodities, countries ranked in the world by commodity, food production, trade, food supply, supply utilization accounts/food balance domain (sua/fbs) (e.g. production, trade, feed & seed, waste, other utilization, consumption, quantities, calories, proteins, fats), food security, food prices, resources, forestry, fisheries, country data. The National Agriculture Statistics Service (NASS) is one of the main statistical gathering units of the USDA, and publishes U.S., state, and county level agricultural statistics for many commodities and data series. It covers data on crop production, livestock production, costs and prices, demographics, and environmental aspects of agriculture.Data can be retrieved by commodity, watershed, state, county, nationally, and by year. The USDA Crop Production Annual Summary contains annual U.S. data for acreage, yield, and production by crop. It also includes data from the previous two years for each crop. Ranges from grains & hays (e.g. corn, oats, wheat), oil seeds (e.g. canola, soybean, sunflower), cotton, tobacco, sugar crops, dry beans, peas & lentils, potatoes & miscellaneous crops. Here is an example of annual crop production reports for Wheat (1886 to the present). Note: All reports are formatted for 132 columns. The FAO Fisheries and Aquaculture Department provides advice and objective information to Members to help promote responsible aquaculture and fisheries. To fulfil this role, the Department compiles, analyses and disseminates fishery data, structured within data collections. This page gives you access to detailed tabular data from the CalFish Database. The data are organized by category, and query results can be narrowed by including additional criteria such as species, or location. Main categories are: Adult Return-Estimates of Spawning Population, Adult Return-Peak/Other Spawning Counts, Adult Return-Redd Counts, Dam/Weir Counts (Adult or Juvenile), Dam Facilities, Hatchery Facilities, Fish Barriers, Harvest-Freshwater/Estuary, and Harvest-Marine. Includes: Recreational Selective Coho Season Updates, Current Year to Date Salmon Catch and Effort Estimates, Historic Recreational Fishery, and Historic Commercial Troll Salmon Fishery. These are statistical resources by the Food and Agriculture Organization (FAO) of the United Nations. A global spatial database of subnational agricultural land-use statistics. AQUASTAT is FAO's global information system of water and agriculture developed by the Land and Water Development Division of FAO. AQUASTAT provides users with comprehensive statistics on the state of agricultural water management across the world, with emphasis on developing countries and countries in transition. 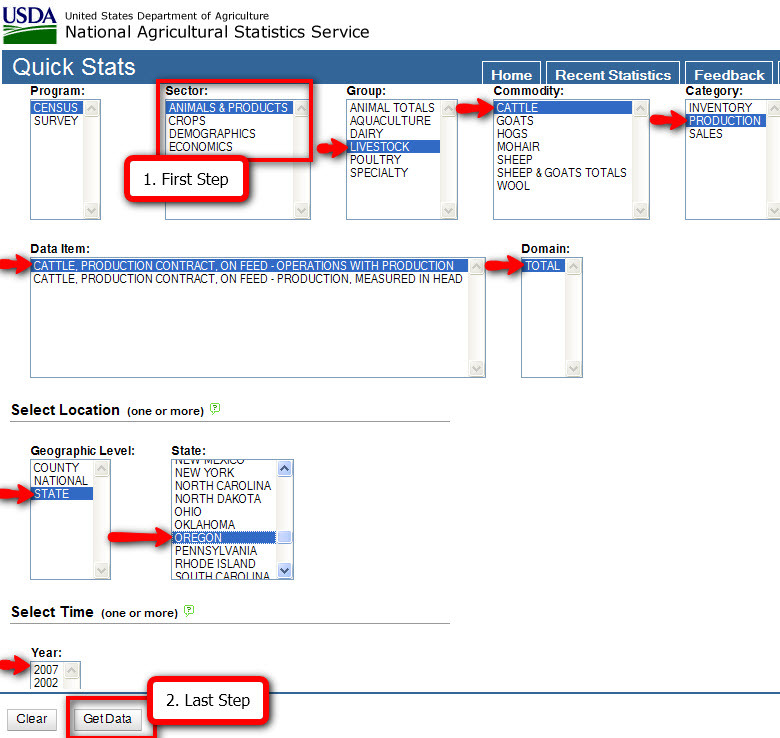 A national statistical information system for food and agriculture. 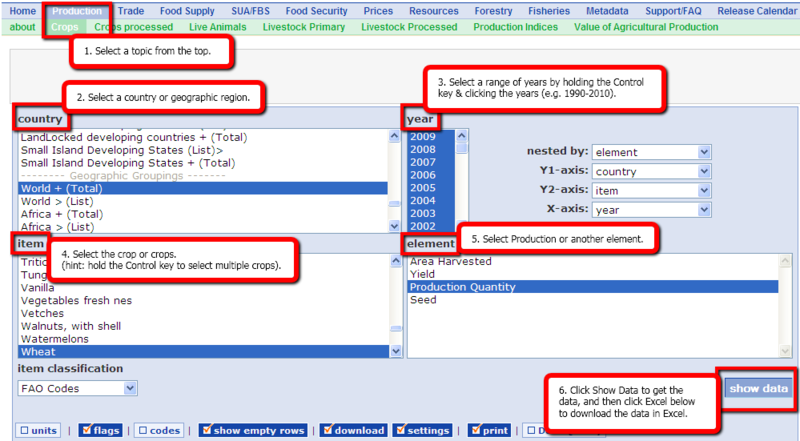 CountrySTAT harmonizes and integrates data on food and agriculture coming from different sources. Through a core database, policy makers and researchers can group data across thematic areas -- such as production, trade and consumption -- in order to study relationships and processes. The FAO Statistical Database is an on-line multilingual database currently containing over 1 million time-series records from over 210 countries and territories covering statistics on agriculture, nutrition, fisheries, forestry, food aid, land use and population. Provides statistics on crops, livestock, irrigation, land use, fertilizer, pesticide consumption, and agricultural machinery. Provides statistics on fish production and primary products. Provides statistics on imports and exports of woods and paper. Forestry Country Profiles contain statistics on forest and forestry issues on a country by country basis including forest cover, plantations, volume and biomass and fires. The Global Livestock Production and Health Atlas (GLiPHA), is a user-friendly, highly interactive electronic atlas using the Key Indicator Display System (KIDS) developed by FAO. The atlas provides a scaleable overview of spatial and temporal variation of quantitative information related to animal production and health through the combination of maps, tables and charts. The PAAT secretariat combines the forces of FAO, WHO, IAEA, and OAU/IBAR to promote integrated trypanosomiasis control through coordinated international action. The ultimate goal is to improve food security and sustainable agricultural and rural development. Land resource potential and constraints statistics at country and regional level. Statistics are based on various small scale maps and inventories that were not always up to date, reliable or both.